Should I be excited or depressed? I noticed a new incoming link to my blog this week which comes from the Halfdone NZ Blog Stats. This site is listed there as the 389th most popular blog in NZ. Which equates to the 12th most popular education blog. More info on how these ratings are compiled are here and if you think your blog should be, let the post author know, politely. Here are your top educational blogs, including three that have not been updated in a while but still must be pretty popular. If you are anything like me you have a folder on your laptop containing numerous readings, research reports and other publications just waiting for you to find the time to read them. Here are some of the current contents of that folder, some summer reading for you before the new school year starts again. 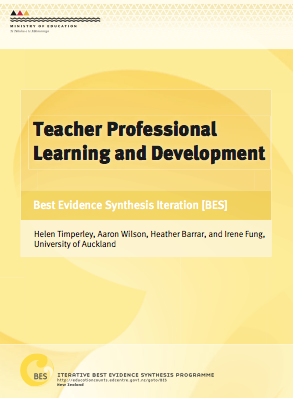 ULearn09 Spotlight with Prof. Helen Timperley co author of the Teacher Professional Learning and Development: Best Evidence Synthesis Iteration (BES). The good news too is that this huge document has been synthesised into an brochure/pamphlet format to make it more accessible to educators, available here. What are the kinds of teacher professional development and learning that leads to improved student learning? Firstly, why do teachers need PD? Amongst other reasons, knowledge is changing and the way our students learn is becoming clearer as more research and information comes to light. Teachers learning from experience is not enough! Shaped by the context in which teachers practice. e.g. the environment, opportunities for PD and the students themselves. Firstly formative assessment. Formative assessment works for teachers in the same way that it does for students. Teachers know why they are learning and what they are learning. They are in control of and monitor their own success. This is a key point as so often what we practice in the classroom is not mirrored in professional learning opportunities such as teacher only days or after school workshops. We need to adapt what we integrate into the classroom, and what we know works for our students, into our professional learning opportunities. Secondly, effective professional learning is embedded in the teacher inquiry cycle (the following stages are adapted/revised from those in the BES). Focus on valued student outcomes: (matched to appropriate teaching activities or learning experiences). The success of any PD is determined by student outcomes NOT teacher skills. Worthwhile content: known teaching knowledge and skills form the basis of effective PD, supported by research evidence. Integration of knowledge and skill: essential to promote deep teacher learning. Deep knowledge of curriculum, how to teach effectively and how to assess. Integrating theory and practice. Assessment for professional inquiry: a formative approach to what teachers need to know based on their analysis and information on student achievement. Multiple opportunities to learn and apply: within a supportive and trusted and challenging environment. Approaches are responsive to learning processes: different types of PD are required that relate to existing teacher beliefs. Teachers are as diverse as their students. Opportunities to process new learning with others: teacher interaction, focused on student outcomes, helps teachers put new learning into their existing practice. Knowledgeable expertise: to challenge assumptions and beliefs, develop new knowledge and skills. My eFellowship research report is ready to go. The research investigates the formative beneï¬ts of eportfolios using two case studies of primary school classes as they implement an online eportfolio solution. Observations and interviews with students and teachers and the eportfolios are used to compare the outcomes with the underlying characteristics of formative assessment thus answering the question, what are the formative beneï¬ts of eportfolios? The 2008 eFellows all met up for the final time last week. While tying up any loose ends and finalising our research we all managed to squeeze in a videoed discussion on our research or a related topic for the EdTalks site. Not expecting to see my video online until next year I was surprised to see that it is ready to go. I have not had a chance to view it yet but will get on to it straight away thanks to the free WiFi at the Rangiora Library. 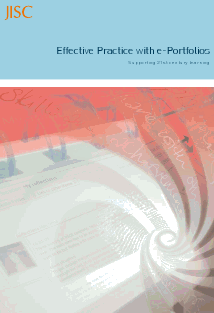 JISC has released a new publication, Effective Practice with e-Portfolios: Supporting 21st century learning, available here. JISC (Joint Information Systems Committee) has the mission to provide world-class leadership in the innovative use of ICT to support education and research. 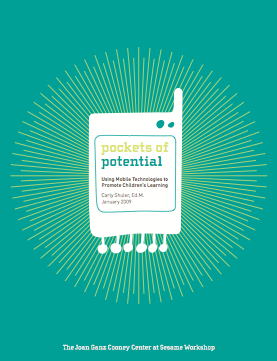 While this report is based on findings and studies in higher and further (beyond secondary) education, it is a wealth of information for anyone interested in eportfolios whether you have your own established system or are embarking on the journey. It looks at eportfolios from 5 different perspective: the learner’s, practitioner’s, institution’s, life-long learner’s and audience’s. It includes narratives from people as they experience eportfolio-based learning as well as many diagrams to clearly explain the processes involved. This is not a one stop, how to use eportfolios to support learning guide, but the experiences, advice and case studies highlight many considerations and decisions that you will need to make in order to successful implement eportfolio-based learning. JISC also has an online resource JISC Infonet: good practice and innnovation, which provides details on more projects and provides plenty of links to other resources. As a follow up to my last post I have just read the following article as part of my efellow research. This may be of interest to those of you who would like a further and much more detailed (yet easy to read) explanation of using the benefits of Web 2.0, RSS, XML, Atom, tags, categories for organising ePortfolios and promoting learning. The Learning Landscape: A conceptual Framework for ePortfolios. Chen, H., Haywood, J., Light, T., Tosh, D., & Werdmuler, B. (2006). Available in: Handbook of research on ePortfolios. Hershey PA: Idea Group Reference, pp. 24-32. Well worth a read if you can get hold of it. There is certainly a lot more worthwhile reading in the full handbook which contains contributions from over 100 of the world’s leading experts. Developing digital portfolios: investigating how digital portfolios can facilitate pupil talk about learning. Centre for Learning and Teaching, University of Newcastle, UK. As part of this research project I read a lot of articles in the areas of eportfolios and assessment for learning. Like anything you read, be it a magazine article, novel, or newspaper, as you are reading you can immediately connect (or not) with the text and message. This article was one of those. Throughout reading it I found myself nodding my head and murmuring consent to the ideas and concepts it was discussing as they mirrored some of the central aims of my research. If you are interested in eportfolios, assessment for learning and thinking skills I thoroughly recommend you source a copy of this article. The combination of a digital portfolio and thinking skills has been revealed to be a powerful one with plenty of scope for development in the primary classroom. 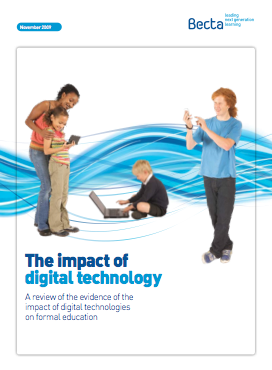 The reflective nature of the pupils’ comments regarding their learning and achievement as part of the digital portfolio gives valuable evidence to support formative assessment theory. …a digital portfolio has the potential to create independent learners who are responsible for the collection of their own evidence of achievements across the curriculum and this process has impact on the pupils and how they perceive themselves and their learning. Another couple of reasons why this research interested my was that it included many quotes from students. The students’ voice really gave the article added authenticity for me and less academic blah. Finally, the fact that this research was undertaken with primary aged children was a breath of fresh air as the majority of research and published articles are predominantly secondary of tertiary education based.